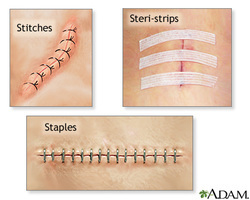 There are many types of surgical incision closure - stitches, steri-strips, staples and topical incisional adhesives. Some surgeons protect the incision with antimicrobial dressings. Some studies suggest an increased risk of dehiscence and infection with the use of staples and stitches due to the potential for exogenous contamination from the environment (hospital or home setting). Topical skin adhesive (TSA) (octyl cyanoacrylate) provide a strong flexible bond that lasts approximately 7-10 days. It eliminates staple removal, can reduce potential for suturing injuries to staff, provides a flexible bonding strength and microbial barrier to the incision. DERMABOND ADVANCED™ Topical Skin Adhesive is a sterile, liquid topical skin adhesive containing a monomeric (2-octyl cyanoacrylate) formulation and the colorant D & C Violet #2. It is provided as a single-use applicator in a blister package. The pen style applicator is composed of a crushable ampoule contained within a plastic applicator. As it is applied to the skin, the liquid is syrup-like in viscosity and polymerizes within minutes. Studies have shown that following application, DERMABOND ADVANCED™ Adhesive acts as a barrier to prevent microbial penetration as long as the adhesive remains. DERMABOND ADVANCED™ Adhesive is intended for topical application only, to hold closed easily approximated skin edges of wounds from surgical incisions, including incisions from minimally invasive surgery, and simple, thoroughly cleansed, trauma-induced lacerations. DERMABOND ADVANCED™ Adhesive may be used in conjunction with, but not in place of, deep dermal stitches. Do not use on mucosal surfaces or across mucocutaneous junctions (e.g., oral cavity, lips), or on skin which may be regularly exposed to body fluids or with dense natural hair. Kendall™ AMD antimicrobial dressings are part of a proven prophylactic infection prevention program. 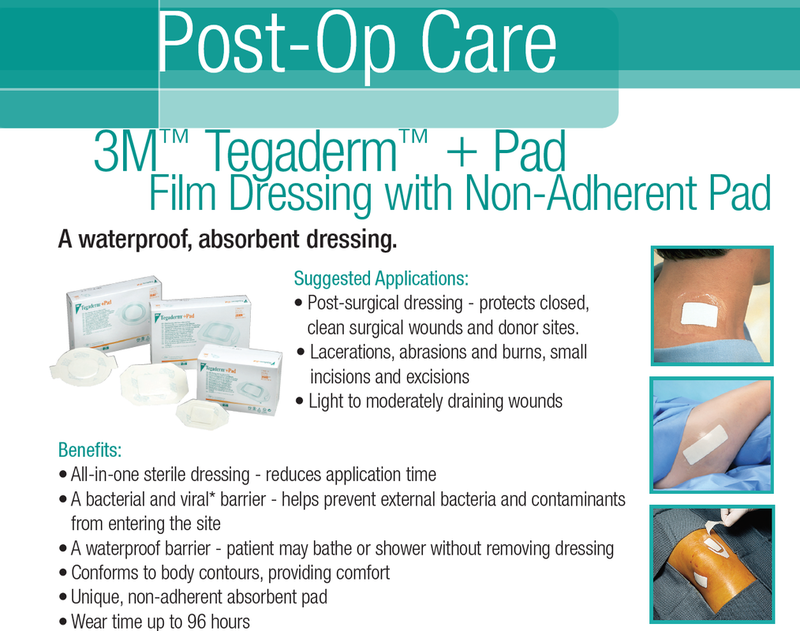 Unlike ordinary sterile dressings which do not provide an effective barrier to bacterial invasion, Kendall™ AMD Antimicrobial Dressings contain 0.2% Polyhexamethylene Biguanide (PHMB), a bacteria-killing polymer that virtually eliminates bacterial penetration through and growth within the dressings.